A parliamentary report of 1777 recorded local workhouses in operation in Heskett (for up to 20 inmates) and Ainstable (10). An 1829 directory records that Penrith had a parish workhouse on Middlegate with Mr Martindale Scott as its governor. The average number of inmates was around 50. Another workhouse (or perhaps the same one) was located on nearby Albert Street. 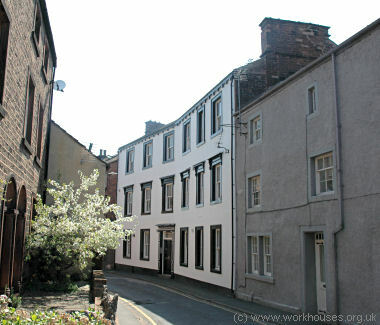 Penrith Albert Street workhouse, 2006. Cumberland: Ainstable and Rushcroft, Berrier and Murrah, Bowscales, Castle Sowerby (2), Catterlen, Croglin, Culgaith, Dacre (2), Edenhall, Gamblesby, Glassonby; Greystoke, Sohnby, Little Blenclow, Motherby and Gill (2); Hesket in the Forest (2), Hunsonby and Winskill, Hutton and Thomas Close, Hutton John, Hutton Roof, Hutton Soil, Kirkland and Blencarn, Kirkoswald, Longwathby, Lazonby (2), Matterdale, Melmerby, Middlescough and Braithwaite, Mosedale, Mungrisdale, Newton, Ousby, Penrith (5), Plumpton Wall, Renwick, Great Salkeld, Little Salkeld, Skelton, Skirwith, Staffield, Threlkeld, Watermillock. The population falling within the Union at the 1831 census had been 21,208 with parishes and townships ranging in size from Hutton John (population 27) to Penrith itself (6,059). The average annual poor-rate expenditure for the period 1834-36 had been £6,199 or 5s.10d. per head of the population. In 1838, the Poor Law Commissioners authorized an expenditure of £3,000 for a new Union workhouse which was intended to accommodate 250 inmates. The site chosen for the workhouse was on Greystoke Road, at the west of Penrith. The building, which was erected the same year, has a very similar layout to the nearby workhouse at Wigton and Cockermouth; all are broadly based on Sampson Kempthorne's 200-pauper model plan published by the Poor Law Commissioners in 1836. The Penrith site's location and layout can be seen on the 1923 OS map below, by which time the workhouse had been renamed Penrith Poor Law Institution. The building consisted of a two-storey main block connected at its centre to a U-shaped main building at the rear. A separate hospital block was located to the north. Penrith hospital block from the south-east, 2001. 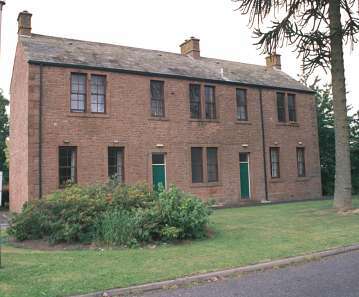 Apart from the hospital block, the workhouse buildings no longer exist and modern housing now stands on the site. In the early 1900s, the union established a children's cottage home at Lark Hall, Robinson Street, Penrith. The premises are now in commercial use. Carlisle Archive Centre, Lady Gillford's House, Petteril Bank Road, Carlisle CA1 3AJ. Holdings include: Guardians' minutes (1836-1930); Admissions and discharges (1873-1955, casuals 1909-51); Births (1837-1935); Deaths (1837-1945); Creed register (1900-26); Punishment book (1884-1947); etc.